The Seattle Music Commission and the Office of Film + Music are proud to announce the return of Seattle City of Music Career Day! 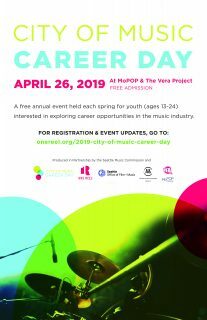 Produced in partnership with One Reel, the Office of Arts & Culture, The Vera Project and the Museum of Pop Culture (MoPOP) provides young people ages 13-24 with direct access to music industry professionals through networking, experiential learning, engaging workshops, and performances. Since 2012, this annual spring educational event, invites participants to engage directly with industry leaders, professionals, and musicians, to learn about the wide range of career opportunities available in music including performance, management, concert production, arts administration, record label operations, retail, licensing, journalism, content creation, marketing, branding, broadcasting, and more. The program provides young people with an opportunity to expand their notion of available music industry career paths; connect with and learn from industry leaders; and network with peers to facilitate creative expression and open up possible career opportunities; with the idea that Seattle’s music industry is vibrant and renowned with opportunity for everyone to participate.